This book will completely change your understanding of healthy food! From now on, you will know that fried food can be useful! Take the dust off your Air Fryer and start to create amazing oil-free fried food for two! Delicious, quick and healthy budget-friendly meals for two with the help of the most popular kitchen appliance - air fryer! 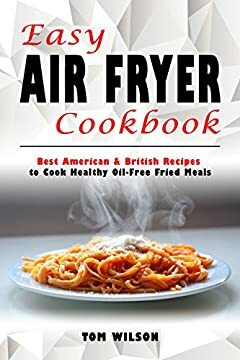 When you hear about Air Fryer you probably don't think about French Fries, English Tuna Sandwiches, Delicious Chicken Drumsticks or Apple Wedges with Cinnamon or even Apple Pie! But it sounds not crazy at all: with the help of this cookbook you will be able to prepare all these tasty meals. Moreover, Air Fryer Cookbook will help provide you main advantages of air fryer cooking. Go ahead and grab you valuable copy right away!